From our earlier post on the topic, here is how we made our solar filter holders for some of our cameras. First we got plastic soya sauce or pepper bottles from the local sundries store. The kind you find in kopitiams or the local coffee shops. They’re made of soft plastic, so they’re easy to cut up with scissors. To start, we cut a hole in the bottom, and cut off the edge of the top as well. For our filters, we exposed a roll of black-and-white film to light and got that developed it. The silver nitrates in the film will serve as the protective filter for the camera. Cut two layers of the developed film together and glue them down to the plastic holder. And voilà — protective filters for your camera. Secure this to your camera with tape. Works great for digital cameras and handicams. If you are going to photograph the eclipse, here’s one way to fashion some protection for your camera. Get some black-and-white film that has been fully exposed to light, and have it developed to maximum density. This method relies on the metallic silver contained in the film emulsion as the protective filter. Collect the roll later… Voilà! You can get creative with how you affix the filter to your camera. Use the universal answer to everything, i.e. duct tape. Build a holder out of string and toothpicks (like the picture on the right). Or build some sort of holder for the filter (like cut a plastic bottle up and paste the filter at the hole at the bottom… which is what we plan to do). If you really have to look at the Sun with a self-made filter, and you’ve heard your science teacher mention this technique in the past, please note that these days, some films use dyes instead of silver. This makes them unsafe for blocking out the Sun properly. So when purchasing the film, make sure to ask the staff at the film shop and that you get the right type of black-and-white film. We’re making our plastic-bottle-filter-holder right now. I’ll post the results once we’re done. This is so fun. More ways to view a solar eclipse safely. Do not use sunglasses. No matter how expensive they are, they are not suitable for looking at the Sun. Looking at the Sun without proper solar filters or other such protection, even briefly, could hurt your eyes, and possible cause blindness. This applies to looking at partial solar eclipses too. Even if 99% of the Sun was covered, the 1% that is still visible is still 10,000 times brighter than the full Moon. We listed out good ways to catch a solar eclipse in a couple of earlier posts (part 1 and 2), but this topic bears a second mention. The safest way to view the Sun’s disc is by indirect projection, such as the pinhole projection method, or a pinhole camera. First, poke a small hole (about 1 mm in diameter) through a piece of paper or cardboard. Let sunlight go through that hole onto a second piece of paper, cardboard or clean surface which serves as a screen. Practically any plain surface will do, like the paper plate in the picture below. An inverted image of the Sun will be projected. Let the pinhole be small, about 1 mm in diameter. If the pinhole is too wide, it will just be a shaft of light passing through the hole. To make the image larger, move the pinhole away from the screen. By the way, it’s exciting and all, and the projection may not look that bright, but do not look through the pinhole at the Sun. 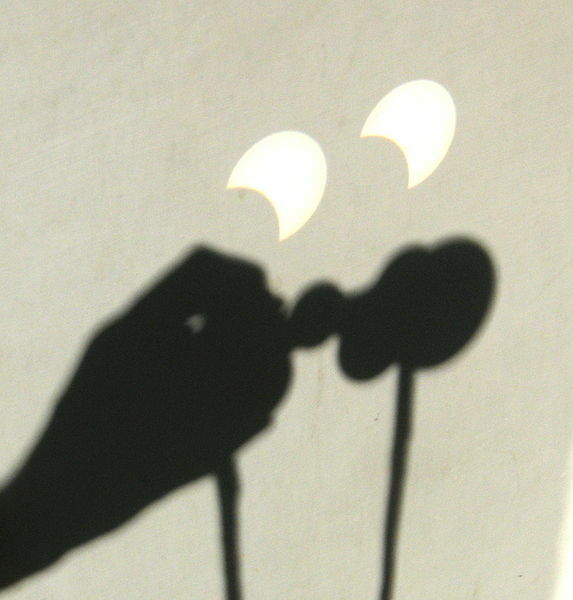 An adaptation of the Pinhole Projection Method of viewing a solar eclipse — projection using binoculars or a telescope. Point a pair of binoculars (with one of the lenses covered) or a telescope towards the Sun and hold a white piece of paper behind the eyepiece. An image of the sun will come out the eyepiece and shine onto the paper, like an overhead projector would shine onto a screen. As the eclipse happens, you can see it in the image of the Sun on the paper. The projection can be made small, or onto a big plain surface for many to enjoy. Erm, again, do not look through the telescope or binoculars at the Sun. Here are more ways you can try to observe a solar eclipse. Point a pair of binoculars (with one of the lenses covered) or a telescope towards the Sun and hold a white piece of paper behind the eyepiece. An image of the sun will come out the eyepiece and shine onto the paper, like an overhead projector would shine onto a screen. Adjust the focus on the binoculars or telescope until the image of the sun has a sharp and not blurry edge. You can also adjust the distance of the paper from the eyepiece. For best effect, the lens should be stable, e.g. place the binoculars a tripod. 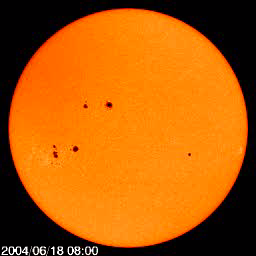 This technique can also be used to observe sunspots. Warning: Do not look at the sun through the binoculars without proper protective filters. Many telescope and camera companies provide metal-coated filters that are safe for viewing the Sun. They are more expensive than common Mylar, but expert observers generally like them better because they are available in various colours, such as a chromium filter through which the Sun looks orange. Through aluminized Mylar, the Sun is blue-gray. As with the Mylar, you can look directly at the Sun through these filters. However, do not confuse these filters, which are designed to fit over the lens of a camera or the aperture of a telescope, with a so-called solar eyepiece for a telescope. Solar eyepieces are still sometimes sold with small amateur telescopes. They are not safe because of their tendency to absorb heat and crack, allowing the sunlight concentrated by the telescope’s full aperture to enter your eye. Viewing the Sun’s disc on a video display screen (provided by a video camera or digital camera) is safe, although the camera itself may be damaged by direct exposure to the Sun.